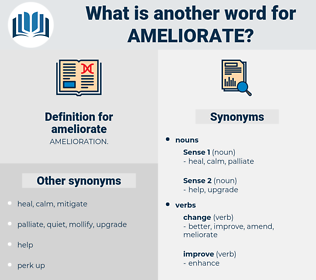 What is another word for ameliorate? take the sting out of something. better, improved, Enhancing, improvement, enhanced. mitigate, Mitigating, relieve, attenuate, ease, lessen, remedy, lighten, correct, de-escalate, reduce, reducing, minimize, allay, assuage, address, soften, remediate, soothe, defuse, abate, refine, compensate, resolve, overcome, redress, strengthen, facilitate, Facilitating, solve, diminish, increase, increased, dilute, streamline, dampen, raise, cushion, offset, improvement, elevate, minimise, moderate, bolster, curtail, optimize, temper, troubleshoot, boost, sharpen, mediate, fix. depress, diminish, blight, lower, debase, corrupt, blemish, reduce, spoil, tarnish, vitiate, impair, harm, flaw, aggravate, hurt, mar, damage. It gave demonstration of how man may unwittingly, and even in opposition to his wit, assist in scattering and multiplying blessings on a smiling land - blessings to last for all time, and perhaps to amend or ameliorate the environment of a budding nation. It is not, in fact, a simple matter of detail like that which has occupied the Municipal Council, which can ameliorate or even guarantee the situation of Paris in so far as it is a rendezvous or a residence for foreigners. raise, bounce back, palliate, upgrade, fancify, down, touch on, educate, perfect, put right, mend, advance, heal, get over, enhance, get well, pick up, furbish up, recover, doctor, restore, condition, iron out, alleviate, make pure, fix, fine-tune, assuage, repair, revitalize, aid, purify, bushel, reform, develop, recuperate, refine, regenerate, turn around, fructify, beautify, help, distill, see the light, build, sublimate, enrich, build up, hone, embellish, relieve, lift, polish, convalesce, surge, straighten out, emend, prettify. 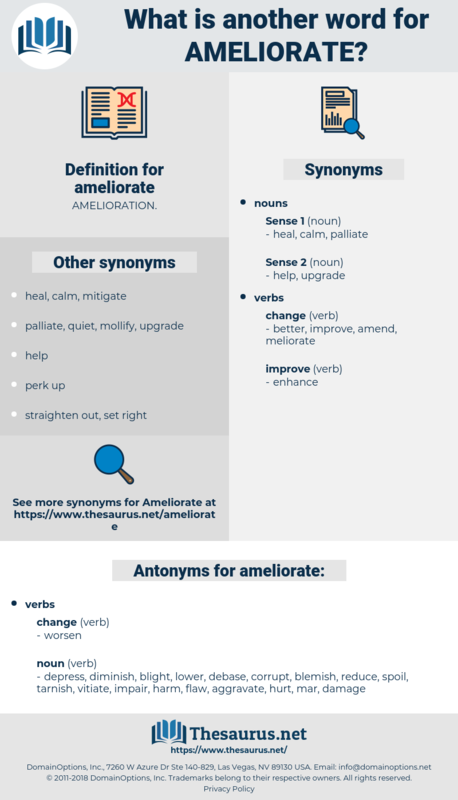 alter, modify, change state, change, turn.